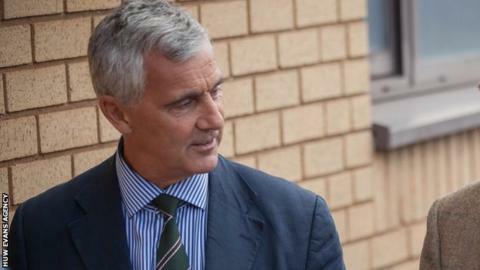 Newport Gwent Dragons chief executive Gareth Davies says the dual contracts introduced by the new Rugby Services Agreement should not necessarily be used to bring back players from abroad. The six-year deal ended the long row between between the Welsh Rugby Union (WRU) and the four Welsh rugby regions. A minimum of six home-based stars will be on dual WRU-regions contracts. "My look on this is the horse has bolted for the players who have gone overseas," Davies said. "I don't blame them for going but I don't think they can expect to have a free ride coming back now with increased wages. "We have to look at the next generation. "It's probably a mixture of both, there isn't one right answer here. Circumstances will dictate and every case will be addressed on its merit, whether it's a case of getting the expensive players back, which means we contract less players." In future, players based outside Wales could be overlooked in favour of home-based talent, but those already abroad will be exempt from the new selection rules while their contracts run. Additionally, each of the regions - Cardiff Blues, Newport Gwent Dragons, Ospreys and Scarlets - will only be able to sign six non-Welsh qualified players. "The selection of players for national dual-contracts and the squad itself will be down to [Wales coach] Warren Gatland." Davies added. "It'll be interesting to see which players Warren decides to go for in terms of contracting." Davies believes increasingly strong links between Gatland and the regional coaches will help the best talent from the grassroots game progress towards the national set-up. "That will end up in the best players being selected for the dual-contracts, our best players being selected for the squad, which results in the division of money to the appropriate place," Davies said. "I don't think we have an issue for that as long as it's done for the proper rugby reasons, which obviously Warren Gatland has in mind. "I think as it stands the region [Dragons] would probably have the lowest representation [of dual-contracted players], but we are more than confident that we've got a generation of youngsters coming through. "Over the six-year period I'm sure there will be ups and downs and fluctuations in how many players are represented from each region."